Focusing exclusively on learning new tangle patterns, each week we will learn at least six new patterns. This is for the Zentangle artist who can’t get enough new patterns. Patterns will be demonstrated step by step, along with easy to learn variations to create new looks. Simple shading and composition techniques will be taught to add the “WOW” factor to your work. 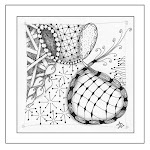 This class is designed for any Zentangle artist above introductory level. Materials may be purchased in class, or brought from home. Contact the instructor at zentangle@comcast.net for a list of materials or with any questions.